Mounted on hydraulic legs, this crystal mineral crusher is designed to provide an alternative trap for carving your own path through the Fungal Caverns. The Crystal Mineral Crusher Trap is a Limited Edition weapon not sold by any Trapsmith. It may only be obtained from opening a Season 4 Treasure Chest. Each Season 4 Relic Hunter Treasure Chest has a chance of containing the Crystal Mineral Crusher Trap. The more Season 4 chests you open, the greater your chance of finding the Limited Edition trap will be! After opening 29 chests, you're guaranteed to find the trap in your 30th if you have not already found it. My specialized Crystal Mineral Crusher pounded free an additional X! 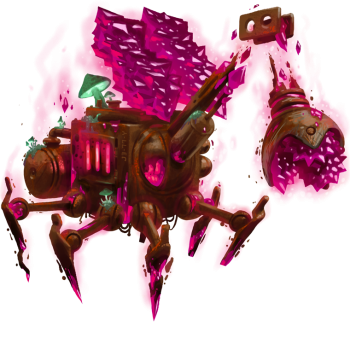 27 July 2016: The Crystal Mineral Crusher Trap was introduced with the release of Season 4 of Treasure Maps. This page was last edited on 12 January 2019, at 12:58.